Chinese authorities on Friday confirmed that a South Korean traveler ― who was designated by authorities as a potential MERS patient ― had been infected with the virus, while two more cases were confirmed in Korea, sparking fears over the possibility of an epidemic. A 44-year-old Korean man, who arrived in China on Tuesday, has tested positive for the virus, the Ministry of Health and Welfare said. 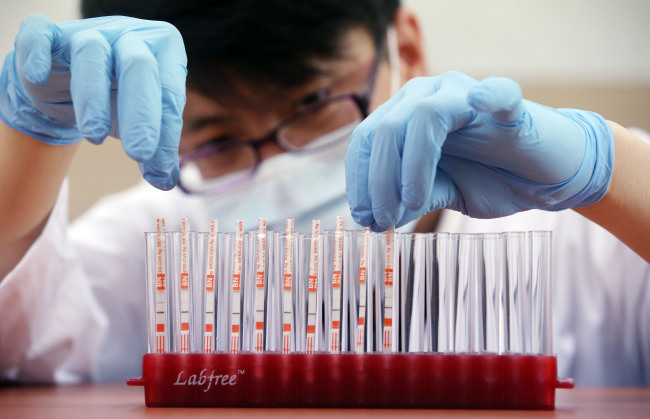 This brings the total number of MERS cases among Koreans to 10, although WHO regulations decree that the latest patient will be recorded as a Chinese case. The authorities said 20 of the passengers who were aboard the same flight as the man, who is the son of one of the confirmed MERS patients, along with the flight attendants are being quarantined and monitored. The Health Ministry came under fire for allowing one of the potential patients to travel outside Korea. Earlier in the day, a 30-year-old female nurse who treated the first Korean MERS patient tested positive for MERS, as did a 56-year-old man who shared a hospital ward with the patient, the MW said. Both were directly infected by the 68-year-old patient zero, who was diagnosed May 20. The nurse had initially tested negative for the virus, but was confirmed to be infected upon a retest. Korea now has the fifth-highest number of MERS ― predominantly found in Middle Eastern countries ― cases in the world. Ministry of Health and Welfare Minister Moon Hyung-pyo reiterated that the government should pool all its efforts to contain the disease. He advised Korean citizens to pay special attention when traveling in the Middle East region, such as to refrain from coming in contact with camels and to immediately report suspected cases of MERS. The health ministry said medical staff members who knowingly decide not to report a suspected MERS case and those who refuse an epidemiological survey could be slapped with a fine of 2 million won ($1,800). Potential patients who refuse to be quarantined would pay a fine of 3 million won. Officials are also planning to substitute a local Ebola hotline with a MERS hotline. The ministry reported that one of the MERS patients ― a 71-year-old man ― is showing respiratory problems and has had to be intubated. As of now, a total of 120 people are being quarantined and monitored by authorities. First reported in 2012, MERS is known to be caused by coronaviruses, a family of viruses causing a range of illnesses. To date, 1,142 people from 23 countries across the world have been infected by MERS, of which 465 have died.